Make sure you make the right impression this Valentine’s Day by spoiling your loved one with a beautiful hand-tied bouquet, crafted just for her by an award-winning florist. This Valentine’s Day surprise her with a limited edition bouquet of 12 perfectly formed scarlet red ‘Passion’ roses, dressed to impress in a stylish matt black standing gift box, tied with a pretty red raffia bow. What’s more, bouquets start from only £19.99! "I never ever get flowers - despite the most obvious hints to my man -so this was a treat. These roses were delivered by courier but were in perfect condition, so beautiful. They came with instructions on how to make them last for as long as possible. They graced my living room for almost 2 weeks before they started to droop and I had to take them away (this is a record for me). What woman doesn't love to receive flowers - I'd send them to her work address for a grand gesture and have her work mates cooing over what a great guy you must be!" 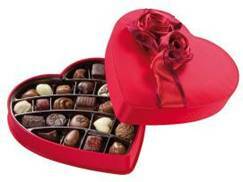 Give the ultimate gift of Godiva’s Romantic Heart boxes. Wrapped in the most seductive red fabric and decorated with silky red ribbons and satin roses, the box forms the perfect package for the most romantic of chocolates. The Romantic Heart boxes are available in three sizes: small and sweet (15 chocolates), heart-meltingly medium (27 chocolates) and lovingly large (40 chocolates). Prices start from £35.00. "Wow! We were sent a small heart shape box of truffles to sample the delights of this Belgian chocolate and we were certainly left wanting more. Although these are expensive - you can certainly taste the difference and my taste buds are pricking up even now as I write this review. If you are a chocolate lover then you have to taste these - although I have to warn you - they will leave you thinking normal chocolate is not worth the effort. If a man bought me these then I would love him forever." An absolute classic, reflecting a fresh and elegant style, perfect for pre-prandial pleasures, cocktails, and for sipping on a terrace. A dependable and subtle Champagne for those simple relaxing moments. For lovers of a more natural taste. Elegant, soft, round and thirst-quenching. The ultimate pleasure in rosé Champagne. Beautifully balanced and finishing on a strawberry note. "I love Champagne and this definitely left me wanting more. I popped the cork with my husband and we drank it together (although I did try and persuade him to move on to lager let me finish it but he wouldn't). To describe it - the bubbles are tiny and there's quite a fruity taste to it - I'm not good at this descriptive stuff am I?! It's really good though, we loved it and we'll buy it again."